Robyn Gribble (red) in action for City of Peterborough Ladies v Harleston. Photo: David Lowndes. City of Peterborough Ladies paid for a glut of missed chances as they lost for the first time in East Division One North yesterday (October 8). Lucy Dakin in action for City of Peterborough Ladies in their 3-1 defeat by Harleston. Photo: David Lowndes. City domainted from the start, but fell behind to a breakaway goal midway through the first half and the visitors scored again to make it 2-0 at the break. City then squandered numerous short corners and skipper Lauren Finding saw a penalty flick saved before Harleston added a third goal. Tierney Augustine claimed a late consolation goal for City. 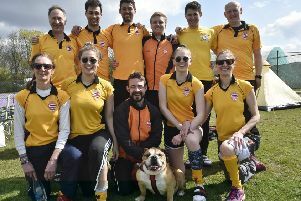 Lucy Dakin was named player-of-the-match. City next travel to Colchester (October 15). City of Peterborough Ladies miss another chance against Harleston. Photo: David Lowndes.